Synopsis: Just wanted to show off some of the slick features in the new SharePoint 2010 MySites and the brand new Social Aspect that comes with User Profiles and Tagging. 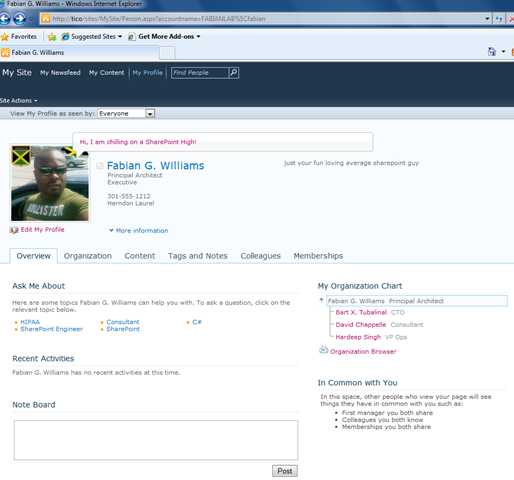 Above: A look at your profile in SharePoint 2010, hmmm think about usability, it seems like I have worked with other social media products that have a similar structure and layout. I want to call out the status update bubble on my profile picture which your colleagues will be able to see upon updates. Also want to call out the “Ask Me About” section with bulleted items, these items are now Tags which will assist you in finding other people with shared skill sets and interest. 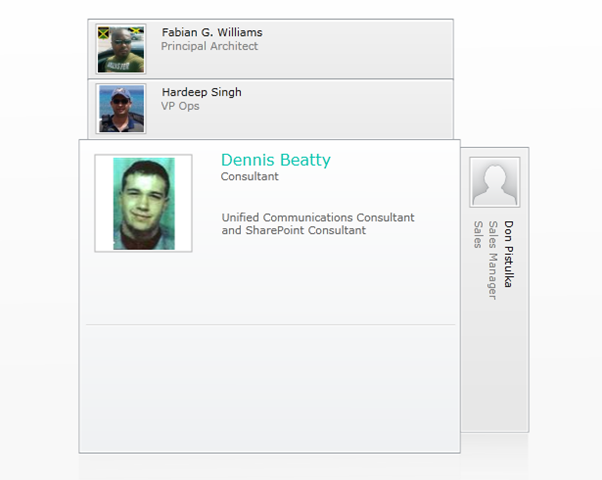 Notice the “ My Organization Chart” also, pulled in directly for Active Directory or your ‘source of record’ for your profiles. Above: A really slick Silverlight Application which allows you for lack of a better word “Fan” through your organizational structure as you would your music/video album; usability again. This view as i clicked on Dave Chappelle are my direct reports. Yes, I robbed the pictures from my Facebook friends profile pictures. In this example, Dave doesnt have any direct reports to him. Notice fanned out left and right are my direct Reports Bart Tubalinal (@bart_tubalinal) and Hardeep Singh (@hardeepsinghm) my work colleagues in real life, obviously this image is not a true reflection of our internal structure …my disclaimer.. 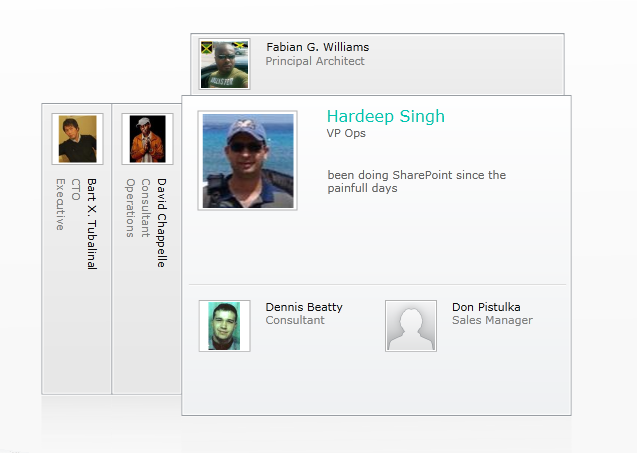 Above: Notice however how Hardeep has people below him and how they are represented, in fact, how we are all represented in the Organization Chart. Visually it is very appealing and structurally easy to navigate. 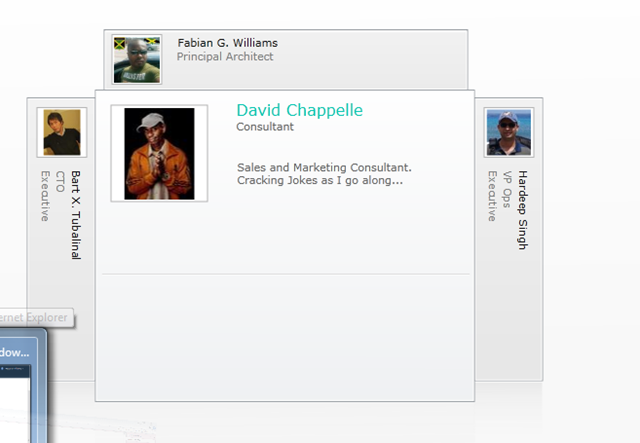 Above: Calling out how the Organization Structure even at layers below is very transparent and easy to navigate. Are you planning an article about how to implemented this? I’m finding it a bit difficult in the beta to be able to get everything configured properly, so it’d be nice to see a walkthrough on how to accomplish something like what you have discussed here. In Beta you have to install a few patches; do a google search or i should day BING for Jie Li; he has a really good step by step how to on configuring Profile services. If not; ping me on what you are having a problem on and I will walk you though it. Ok, so i’ve followed along with all of the guides I can find, installed all patches, fixed, services packs, etc., but still no joy on my install. Currently I’m testing on a VM with a single machine (Server 2008 R2 set as DC in domain). In Jie Li’s walkthrough, on step 7 “Start User Profile Synchronization Service”, after clicking on it, it never changes from “starting”. On step 8, when I go to look at the screen to see the timer job, it never displays the job running. In one of my earlier attempts (performing the exact same steps…I was already familiar with Jie’s walkthrough as I had tried it several times before originally posting on your blog), I had gotten it to start and was able to see it running on the status page. But, regardless of whether I had gotten it to run or not, when I try and create a new connection in the “Configure Synchronization Connections” section, I never can get it to populate with containers if I choose “Active Directory”. It will display the containers if I choose “IBM Directory (LDAP)” and fill in the needed fields, but it never stores the connection after. So, you seem to be doing all that is right so you may not like the answer ill give.. “its beta… ” but that said.. here is something else i did even in RC to get mine to work. I had the same experinces as you; what i did to make it work is to delete the Profile Service Service App and do it over from scratch. Worked like a champ afterwards. What I did this last time was use the global admin account (default “administrator” account for the domain) for absolutely everything…SQL, all services, app pools, everything. When I went to start the profile service this time, it showed as running finally in the job status page, then again back on the services page. After this, I was able to create a connection to my AD and actually get the containers to display. I then created a handfull of accounts, ran the import, and all is well. I really hope that once things get to RC that they fix this some…I cant run the farm under these credentials outside of a test environment…so very bad. Anyways, thanks for the assist…it all seems to be working ok now finally. Hi, what do I need to do in order to see my direct reports display within my organization chart; currently only my Manager is being displayed in SharePoint, even though I do see my direct reports appear the field in my AD account profile. Thanks. Can you please let me where I go to implement implicit relationship changes? 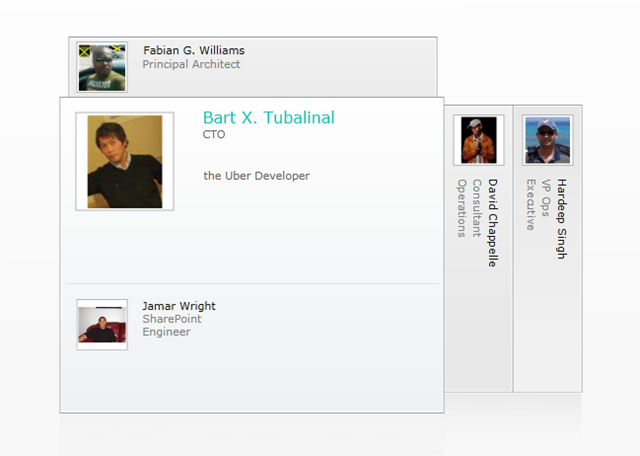 Are you referring to my AD profile or the profile properties within my SharePoint site?